AKCAKALE, Turkey—Tension between Syrian refugees and Turks has steadily increased in recent months, creating political headaches and new social stresses for the Turkish government. Turkey hosts several hundred thousand Syrians in refugee camps and cities, while the Syrian civil war is in its third year with no end in sight. Reyhanli, near Turkey's border with Syria. The tensions were immediately apparent in the aftermath of Saturday's bombing in the Turkish town of Reyhanli, which is near the Syrian border and hosts tens of thousands of Syrian refugees. Police had to restrain attacks on Syrians after the bombs went off. But the friction has also been felt in places such as the small border town of Akcakale, in the eastern province of Sanliurfa. Last week a fight that broke out between Syrian smugglers at the border and local customs officials left a Turkish policeman dead and 11 other Turks wounded. 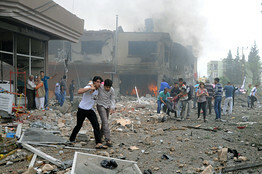 In October, five Akcakale residents were killed as a shell fired from Syria crossed the border and landed in a street. While in March, a violent riot erupted inside a local refugee camp hosting some 31,000 Syrians, after a 7-year-old Syrian girl was killed in a fire caused by faulty electrics. Turkish military police responded with tear gas and water hoses at refugees, some of whom threw stones at the camp workers, demanding better conditions. While many Turks along the Turkish-Syrian border have relatives on the Syrian side, and Turkish families also provide housing for many Syrians, many Turks say the Syrian refugees are increasingly problematic as the war erodes the economy and security. Turks have been alarmed by the growing trend of local businesses using Syrians as cheap labor in eastern border provinces, which are among the most underdeveloped in the country and most of which have a high rate of unemployment. Rents are also rising in many cities, at least partly because of increased demand from Syrian refugees. Turks in Sanliurfa city and Akcakale also attribute the rise of unsolved crimes in the region, especially car thefts and burglaries, to Syrians, even though officials say Syrians are often being unfairly accused. Many Akcakale residents are angry at the Turkish government of Prime Minister Recep Tayyip Erdogan. They criticize what they call an overly tolerant policy toward the Syrians, and what they see as an unquestioning support for the rebels fighting against the regime of President Bashar al-Assad. "Erdogan brought these people down on us. After the shooting of the policeman, he even didn't send a message of condolences to us," said Fevzi Bayrak, 24, sitting in front of a carwash store under a red Turkish flag hung to commemorate the killed policeman. Mr. Bayrak was one of the hundreds of people who gathered earlier this month to march to the refugee camp to protest the shooting, to be stopped by the camp authorities at the entrance. He claims that he had been out of job for months "because of Syrians". While he charges 20 Turkish ($11) lira for a carwash, he explains, a Syrian does the same job for 5 lira (less than $3), he said. "The employers tell me that I can get work only if I work for same prices as Syrians. How can I?" Mr. Bayrak complained, adding that the refugees were "given everything" in the camp and didn't need the work as much as the Turks. But Syrians say they have little choice but to stay in Turkey and try to work. Tariq, a 36-year-old Syrian father of three, who recently got a job working in a food factory in Sanliurfa for 750 Turkish lira ($417) monthly wage, said that he doesn't want to be taken care of. He said he was one of the two breadwinners of a 21-member extended family, crammed into a two-room apartment in Sanliurfa. He asked not to have his family name published because he is working illegally in Turkey. "I don't want us to be dependent and live in a camp. If I could work and support us, I would go back to Syria," he said, adding that many Syrians felt the same. International aid and refugee agencies have praised Turkey for the high-standard of its camps, set up by the Turkish Red Crescent and monitored directly by the prime minister's emergency agency, AFAD, but warn that as the war continues, the camps may prove unsustainable. Turkey started to restrict the flow of refugees into the country after its "psychological threshold" of 100,000 refugees was broken last fall, saying that its 17 camps are already overcrowded with nearly 193,000 refugees, while it continues to build new camps and officially still sticks to its open-door policy. The government says the agency has spent over 812 million Turkish lira ($450 million) on the refugees in camps alone, in addition to distributing aid inside Syria and paying for the treatment of wounded Syrians in Turkish hospitals, among other costs. Turkish foreign ministry official said that the government is currently working on giving special working permits to Syrians to reduce the tension caused by the exploitation of refugees and assist them in becoming more self-reliant.